In this tutorial you are going to learn how to test Skype audio. 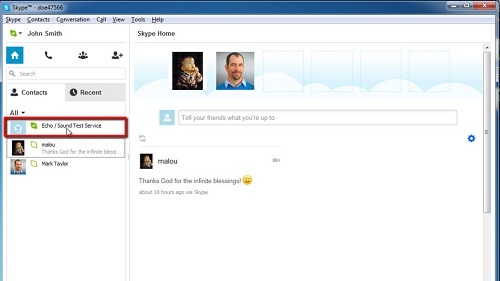 Open the Skype application and make sure you are logged in to your Skype account. From the default home page view, select the “Contacts” tab found just below the search bar, underneath the “home” icon. Select the contact named “Echo/Sound Test Service”. Details of this contact will appear in the right pane of the window and you can see that they are online; this is always the case, so users can always make test calls. 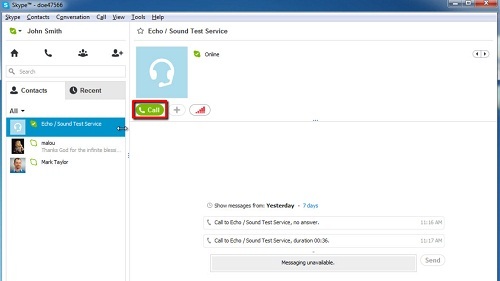 Click on the green “Call” button that appears below the picture of the selected “Echo / Sound Test Service” contact. This will activate a call to the testing service, allowing you to test your speakers by listening to the Skype audio test service and to record your own voice to test your microphone. Follow the instructions of the testing service. This completes the instructions for how to test Skype audio.